Big-box retailers are trying to gain a greater share of the wireless market by increasing their mobile efforts, but wireless carriers are not likely to cede their home turf without a fight. The carrier-owned retail store is not necessarily under siege, but its influence is being diluted by big-box retailers--Best Buy, Wal-Mart, RadioShack and Target--that are keen to cash in on sales of mobile devices and even their own branded wireless services. The struggle is putting pressure on the symbiotic relationship between the two groups: Carriers look to the retailers as a prime third-party distribution point, and retailers, in turn, need to work with the carriers to land the hottest new wireless gadgets. Ross Rubin, an analyst with the NPD Group, explained the dichotomy: On one hand, he said, retailers have stepped up their presence in mobile because they were already offering other products and services that wireless customers are interested in buying. Carriers, meantime, hope to counter that by bringing shoppers into a more intimate setting. "The very nature of the carrier store is to take the consumer out of that notion of wireless as something that is associated with their other everyday needs and ensconce them in the culture and branding of carrier," he said. Despite the recent influx of interest by retailers in mobile, U.S. wireless carriers are not necessarily that much worse for wear. According to NPD, 66 percent of all mobile unit sales were from carriers in the second quarter. Just 10 percent were from mass merchants; 9 percent were from electronics specialty stores; 2 percent were at wireless specialty stores and 13 percent were undefined. Still, in recent weeks retailers have aggressively stepped up their involvement in the wireless market. Wal-Mart earlier this month announced its own postpaid wireless brand called Wal-Mart Family Mobile, which runs on T-Mobile USA's network and will cost $45 per month for unlimited voice and texting. Target in late August announced it will expand a full-service mobile retailing business in its stores that will be operated by RadioShack. The centers will be available in around 850 stores by year-end, and in the majority of Target's stores nationwide by mid-2011. Best Buy, though, has been the most aggressive in its efforts to claim a greater share of the mobile retail market. The company said in April that it will open another 75 to 100 of its standalone Best Buy Mobile stores, and could eventually have close to 1,000 of the stores nationwide. 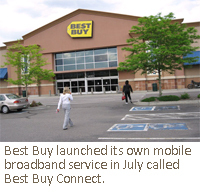 Additionally, Best Buy launched its own mobile broadband service in July called Best Buy Connect, using Sprint Nextel's (NYSE:S) EV-DO network, and plans to launch a similar offering running on Clearwire's (NASDAQ:CLWR) mobile WiMAX network in 2011. Mark Lowenstein, managing director of Mobile Ecosystem, said this all shows that mobile is becoming a mainstream product--and retailers are not going to let the opportunity slip by. "These companies feel that they can make money from mobile," he said, adding that "mobile is not a loss-leader." In addition to taking on carriers in the traditional role of selling a wide array of smartphones and services, retailers are also looking to the accessory market, Rubin and Lowenstein said. Accessories carry high margins, and retailers can often offer a wider selection than carriers. However, Lowenstein noted that retailers often work to attract different market demographics than the ones found in carrier stores. Wal-Mart, for instance, has been heavily hawking TracFone's prepaid unlimited Straight Talk service, and puts prepaid front and center. That might not be the approach carriers take at their own stores, where postpaid products and services are often given marquee attention. Even before the recent wave of interest by retailers in mobile, carriers were already busy reworking their stores to entice customers. AT&T Mobility (NYSE:T) completed a revamp of its more than 2,200 retail stores in July 2009 that included a decision to put phones in power-enabled displays, allowing users to check out the phones' features--a critical element of the retail experience. Meantime, Verizon Wireless (NYSE:VZ) has been testing a new store design concept, called Evo (not be confused with the Sprint phone), which is more modular and focused on discrete market segments like smartphones and enterprise users, said John Colaiuti, vice president of national distribution at Verizon. The stores are filled with more technology, and are designed to mirror the shift in the market toward smartphones, he said. All of the former Alltel stores Verizon acquired in its 2008, $28.1 billion acquisition have been converted to this new system, and Verizon is in the process of converting all of its 2,000 retail stories to the model. "Wireless stores years back were more transactional, and we wanted to make it more of a shopping experience than transactional," he said. Sprint also has been re-tooling its retail experience at its 1,000 retail stores. In 2008, the company launched its Ready Now program, a free service that allows users to get an in-depth tutorial on their smartphones before leaving the store. "We certainly recognize that we have to provide support," said Jeff Hallock, vice president of national distribution for Sprint. Sprint has adopted approaches from the retail world. With the launch of the Samsung Epic Android phone, Sprint for the first time let customers reserve a new device before it launched. AT&T has taken similar measures with the latest versions of Apple's (NASDAQ:AAPL) iPhone. Sprint's Hallock said both retailers and carriers are taking new, holistic approaches to retail, focusing more on customer care and the quality of the experience than on simply grabbing cash. The relationship between carriers and retailers ultimately comes down to an uneasy alliance. On the one hand, analysts said, carriers deeply appreciate the reach big-box retailers afford them. One the other hand, Lowenstein said, an "overly crowded distribution landscape" could force consolidation, squeeze carrier-owned stores and even squeeze out third-party reseller stores and dealers affiliated with the carriers. Carrier stores are often much smaller than those of big-box retailers, Rubin said, meaning carrier stores typically focus on efficiency, quality and trying to get as much revenue out of each customer as possible. "They're simply not going to be able to stock the wide range of digital lifestyle options that you could get at a Best Buy or even Wal-Mart or a Costco," he said. The carriers contend that it is their customer-focused approach that will win the day. Carriers conspicuously avoid doing anything that would label their networks "dumb pipes," but the same philosophy applies to their retail stores, carrier representatives said. They should not and will not be viewed simply as places to go to when customers have a problem with their phone, they said. 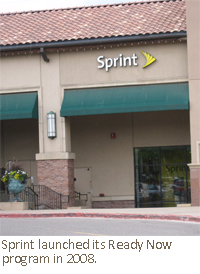 "A typical retailer works on margins per square foot of floor space," said Bob Johnson, Sprint's chief service officer. "When customers really want hands-on, quality service, they're going to look for the Sprint shingle." Lowenstein said that, ultimately, the changing dynamics in mobile retail could improve the shopping experience. "It forces the operators to be more competitive," he said. "They're trying to create more reasons for you to walk into their stores."